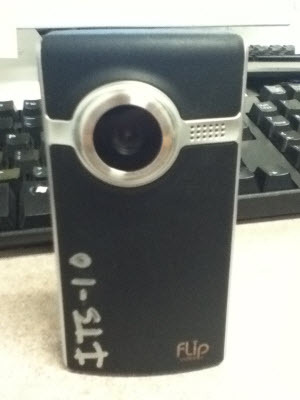 Overview and instructions for using the Flip Cams available for rent from the ITS Help Desk. For more information, contact the Help Desk at x3333 or helpdesk@etown.edu. After recording, press this button to review your video. Click the red button to record, use the keypad during playback. During playback, click this button to delete your file. Slide this key down to access the USB functionality of the Flip Cam. 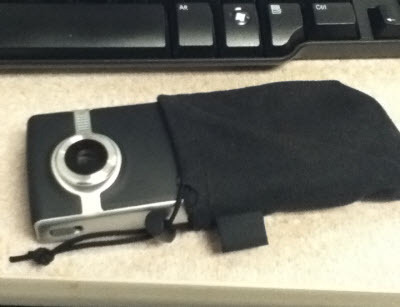 Step 1:Remove the Flip Cam from its soft cloth carrying case. Step 2:Power on the device using the power button. Step 3:Click the red button to begin recording. Step 4:Record your video.Step 5:Click the red button to finish recording. 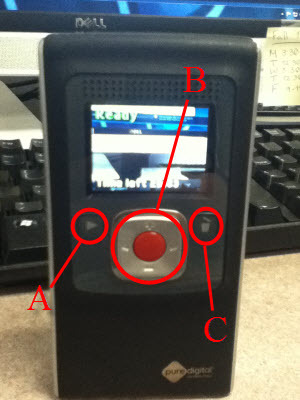 Step 6:Review your video using the playback button and/or power off the Flip Cam. You have now recorded a video.